With the S&P500 down 9% off its high this month after last week, the question everybody is asking is whether this is a buying opportunity or the beginning of a new phase in the market. I have no idea. Nobody really does. I suspect this week will be bumpy but will rally off Fridays’ lows as there is some cheap names who have been hit hard. I have been modestly dipping my toe in on some names but am waiting before making any big moves. I hope to post on a few of the stocks regularly mentioned in this blog in the coming weeks. The underlying concerns about the global economy and trade, the impact of US rate increases and quantitative tightening, Italy, to name but a few, have been and continue to be real issues to consider. The fact that the market has turned on a penny and is now all worried about the issues it shrugged off a few weeks ago is, well just how markets are! What I do know is that this bull market has all been about earnings and margin growth, nothing else matters. 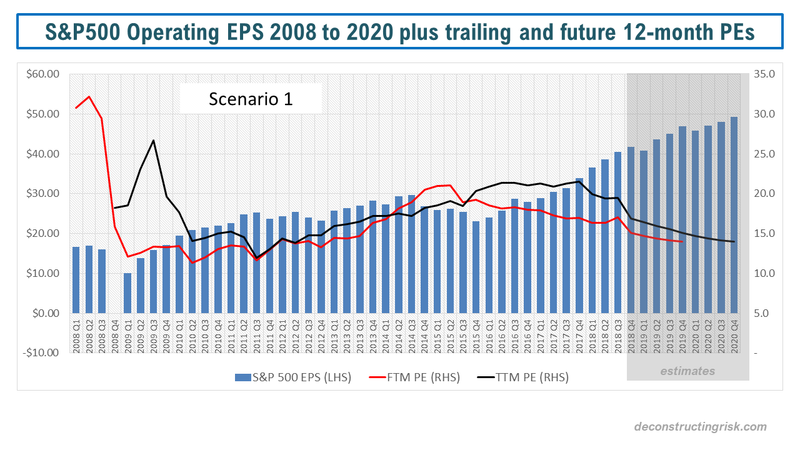 So, I took the latest operating EPS and sales estimates for 2019 from S&P, extrapolated them into 2020, assuming a modest slowing of the EPS growth. These operating margin figures and assumed sales figures form the basis of Scenario 1. Stressed operating margin and sales formed the basis for Scenarios 2 and 3, with Scenario 2 falling back to the 2013-17 average operating margin of 9.5% and Scenario 3 falling more severely to the 2008-18 average of 8.75%. 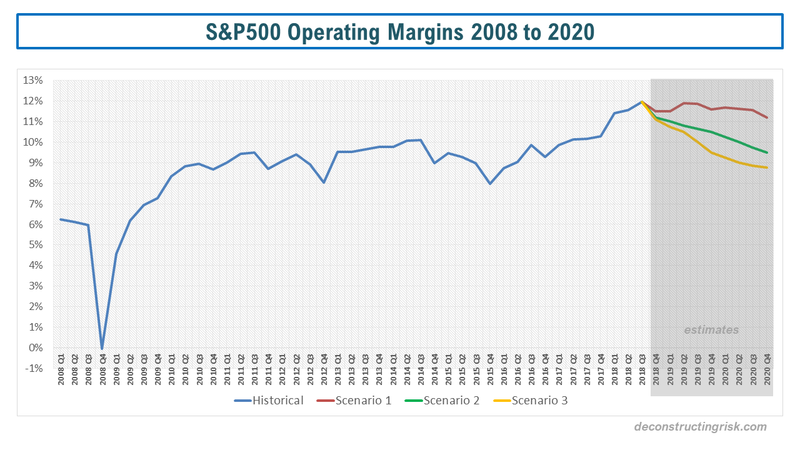 The graph below shows the operating margin assumptions in a historical context for each scenario. Assuming a price for the S&P500 as per Friday’s close of 2,659, the EPS figures with respective trailing and future 12-month PEs are as per the graphs below. So, if the current operating estimates for 2019 stand up and continue into 2020 as per Scenario 1, then I would say the current dip is a buying opportunity with a forward 2019 and 2020 PE of 15 and 14 respectively. 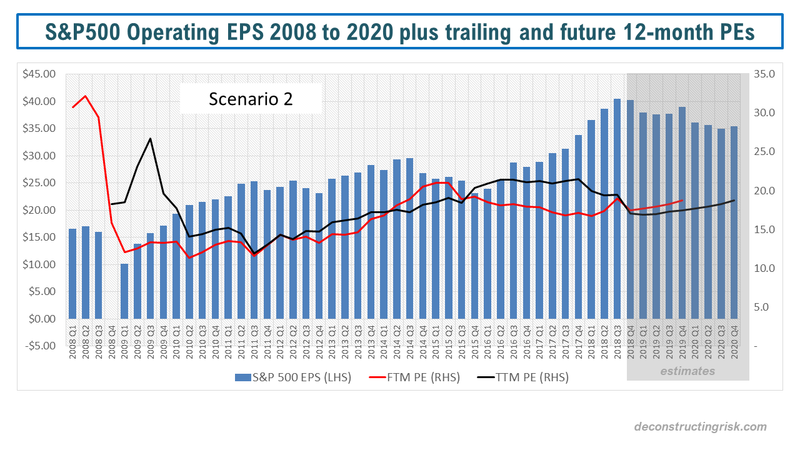 If, however, you feel that we have reached peak earnings and a modest enough EPS retrenchment over 2019 and 2020 is likely as per Scenario 2, then the current S&P500 level looks vulnerable to further downside as the implied forward PEs of 17.5 and 18.7 for 2019 and 2020 look rich in a downward trending EPS environment. If, as per Scenario 3, the EPS retrenchment is more severe, then we are in for a very bumpy ride with another 15% to 25% downside possible. To state the obvious, the current market focus is all about the earnings outlook for 2019 and 2020. The mid-terms over the next few weeks will be another factor to consider. It will be interesting to see if the market focus moves away from the economic prospects over the next few years and more towards 2018 bonuses and end of year window dressing as this quarter progresses! This entry was posted in Equity Market and tagged 2019 EPS estimates, 2020 EPS estimates, buying opportunity, earnings growth, EPS projections, EPS retrenchment, forward PE, global economy, global trade, historical operating margins, implied forward PE, margin growth, price to earnings multiple, projected operating margins, quantitative tightening, S&P 500 operating margin, S&P 500 sales, S&P500, S&P500 EPS estimates, top line growth, trailing 12 month PE, uncertainty, US equity valuations, US rate increases, valuation multiples. Bookmark the permalink. What made me scratch my head was the slowing in revenues… operating earnings can be “improved” by ignoring “non-recurring” costs (which for some weird reason seem to be recurring nevertheless), but pimping revenues is more difficult. If this trend persists you don’t need any margin compression for lower EPS. But then I have been somewhat bearish for quite a while, so take that with a pinch of salt :). hey Eddie, good to hear from you. I hear you on revenues, my assumption on average quarterly revenue growth over 2019 & 2010 was 2.5%, 0.5% and -1.5% for each scenario 1, 2 & 3 but absolutely if revenue takes a bigger it and margins are in the same range then EPS will decline. I was more thinking of a cost inflation push slow-down with higher interest rates but all of these factors will slow revenue too. Either way, it doesn’t take much to push earnings off their peaks and the market is obviously freaking about it. Once the midterms are out of the way, will be interesting to see if Trump tries to get a deal with China now we are starting to see blood on streets. Hope all good with you. Any red flags emerging from the credit markets? Thanks. All is good, I just have been rather busy lately. Inflation (cost inflation to be precise) has been my favorite bogeyman for quite a while. Not sure whether you know this guy (https://www.thebottomupeconomist.com/). He (or they) follows conference calls from a group of SMEs and blue chips (around 300 names) and produces relevant sound bites from that. Inflation seems to be an issue on the ground (think wages, freight, tariffs to some extent) but doesn’t show up in the aggregate statistics (yet). Since the market seems to be rather fragile right now a little more bad news might have quite an impact. Agree on the midterms. My feeling is that his trade (or no trade) advisors are playing the long game, though. Credit markets are surprisingly calm. Usually I would expect credit spreads to lead any downturn and so far there is nothing to see. A lot of tinder out there imo, like the fact that about half of all US corporate bonds are rated BBB and will become ineligible for large buyer groups (pension funds, insurance companies and the like) once they drop to non-investment grade or the record weak covenants in HY land. So far nobody seems to care… on the other hand I have no idea what could provide an appropriate spark to start the fire. I will continue to watch that space closely.